Hotel Hell lies just a few minutes walk from the center of Ortisei, right on the banks of Rio Gardena, where the cycle path runs through the whole Val Gardena. With its unmistakable alpine style architecture our charming hotel is an ideal location for those who, among our guests, want to discover the small, great world that is the valley where we have chosen to live and work. 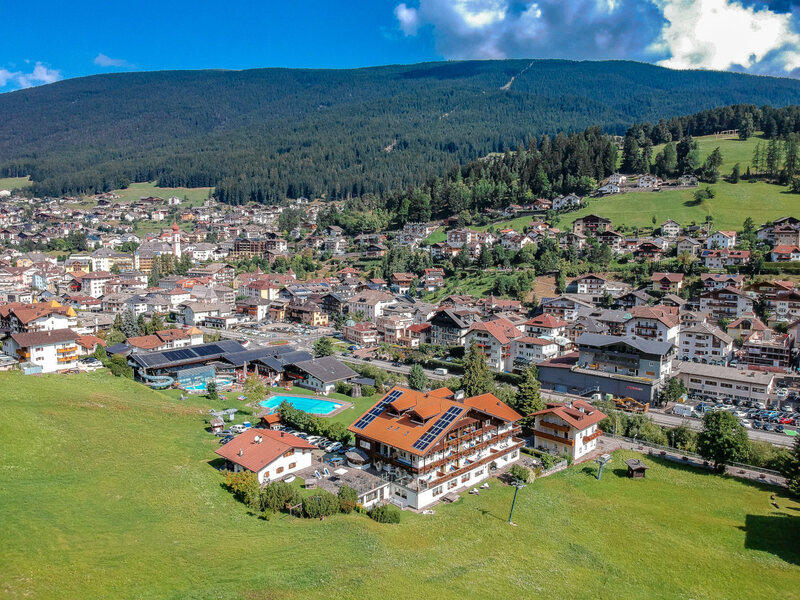 In addition to the cycle path and the pedestrian walkway leading to Ortisei, just outside the door of the hotel lies the ski lift that in winter brings skiers to the slopes with unforgettable views of the Alpe di Siusi. Not far away, there is also a children’s ski slope.It is the famous Palmer slope, the same on which every New Year’s Day the traditional and evocative torchlight Ski Show takes place. 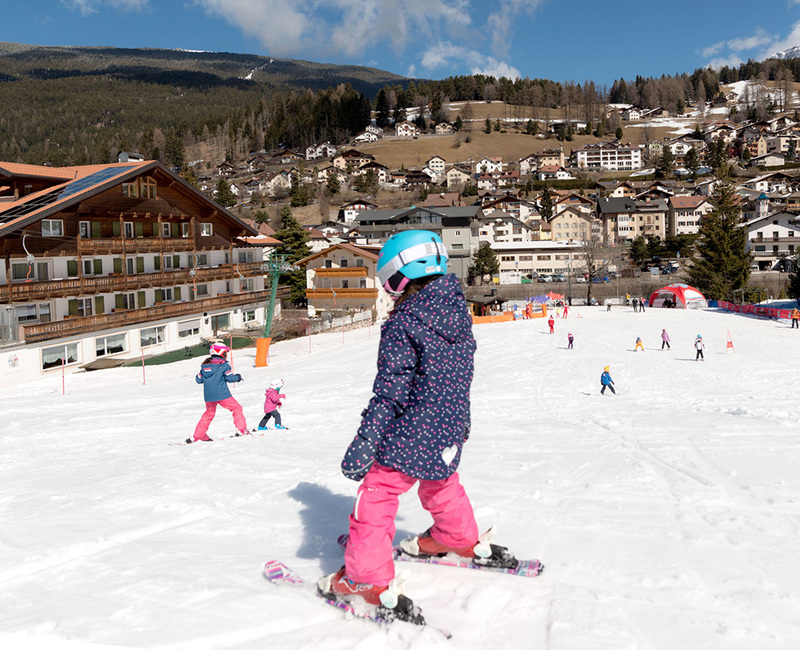 Here, small skiers can experience the first leaps in safety, accompanied by friendly and prepared instructors. And these are just some of the many opportunities you will find staying at the hotel Hell, our hotel in Ortisei, where you will find many comfortable rooms suitable for your needs. Happiness begins when you forget about the time that goes by. Speaking of rooms: We have a whole range of categories from which you can choose. The range extends from the standard room for those who are mainly looking for sport and entertainment, to spacious suites equipped with every luxury. Whatever you choose, every room will make your holiday with us a memorable one. in the coat of arms of Hotel Hell for, your hotel in Ortisei? Good question! After all, the meaning of the T in the coat of arms, which decorates our hotel, is not clear at first sight, especially if you read the symbol as a letter. Which it is not. Rather, “The New Siebmacher,” a roll of arms and at the same time one of the most important heraldic books, explains the symbol as the cross of Saint Anthony, over which a six-pointed golden star shines on a blue background. For the first time, the family coat of arms can be found on the tombstone of Michael Hell, which is now bricked in the bell tower of the parish church of Aichach in Bavaria. There, Hell was one of the most influential families in the region. From 1513 to 1522, Georg Hell was mayor of the city.What remains unclear until today is the question of how the family Hell landed in Val Gardena. But this makes no difference to our hotel: it bears family names and coat of arms with pride.